What are the Consequences of an Abnormal Nerve Firing Pattern? Is an Irregular Firing Pattern More Deleterious for Cardiovascular Health? In humans, sympathetic activity is commonly assessed by measuring the efferent traffic in the peroneal nerve. The firing activity is the sum of several active neurons, which have the tendency to fire together in a bursting manner. While the estimation of overall sympathetic nervous activity using this multiunit recording approach has advanced our understanding of sympathetic regulation in health and disease no information is gained regarding the underling mechanisms generating the bursts of sympathetic activity. The introduction of single-unit recording has been a major step forward, enabling the examination of specific sympathetic firing patterns in diverse clinical conditions. Disturbances in sympathetic nerve firing, including high firing probabilities, high firing rates or high incidence of multiple firing, or a combination of both may impact on noradrenaline release and effector response, and therefore have clinical implications with regards to the development and progression of target organ damage. Understanding the mechanisms and consequences of specific firing patterns would permit the development of therapeutic strategies targeting these nuances of sympathetic overdrive. Microneurography, a technique developed over 40 years ago, was developed in order to record sympathetic traffic in peripheral nerves supplying the skeletal muscle vascular bed in humans. Direct recording of multiunit efferent muscle sympathetic nerve activity (MSNA) has been used extensively to evaluate sympathetic neural drive in the healthy state as well as in a number of conditions, most of which are associated with elevated cardiovascular risk. While the direct recording of multi-unit MSNA provides an estimation of overall sympathetic activity the method does not allow the discrimination of how the activation is brought about nor the mechanism by which changes in sympathetic nerve firing can occur. Indeed, a variety of mechanisms, including recruitment of active fibers, increased probability or rate of firing of active fibers or increased discharge (multiple firing) within a sympathetic burst may be involved in generating the increased sympathetic nervous activity (Macefield et al., 1994). In order to gain more information about the specific mechanisms underlying the degree of sympathetic nervous outflow the technique of microneurography was refined to enable the recording of the firing pattern of single vasoconstrictor neurons. This review will focus on the developments in sympathetic nerve recording and analysis that have permitted the evaluation of single-unit sympathetic nerve activity. Sympathetic bursts are generated by the simultaneous activity of several neurons, and sympathetic nerve activity can be modulated differentially both in terms of the frequency and amplitude of bursts. Changes in sympathetic outflow involve either change in the recruitment of subpopulations of neurons to fire synchronously and/or changes in the firing frequency of already active nerve fibers. The firing frequency of individual fibers can be modulated by two mechanisms: (i) the proportion of neural bursts in which the fiber is active (firing probability); and (ii) the number of spikes that a fiber generates per burst (multiple within-burst firing). When measuring multiunit MSNA, the main issue is that the interpretation of the signal remains, to a degree, equivocal given that the amplitude of the signal is dependent on the proximity of the electrode tip to the active nerve fibers. Multiunit sympathetic nerve activity is commonly quantified by simply counting the number of bursts occurring over a period of time or, to account for heart rate variation, calculated as bursts per 100 heartbeats. While the technique is robust and provides valuable data, no information is gained about the number of active fibers or the underlying mechanisms generating the sympathetic bursts. Using high impedance electrodes, Macefield et al. (1994) refined the technique of microneurography to enable the recording and firing properties of individual muscle vasoconstrictor neurons (single-unit MSNA). Such recordings are technically demanding requiring the subject to be highly involved as any slight muscle movement may compromise the quality of the recordings and many needle adjustments are necessary to identify satisfying spikes. Secondly, the analysis requires careful attention and stringent criteria for the acceptance of a recording as being truly unitary. However the approach permits a more detailed examination of sympathetic nerve activity. Indeed, the firing properties of sympathetic neurons may now be analyzed in terms of: (i) the mean firing frequency (spikes per minute or spikes per 100 heartbeats), (ii) the firing probability (the percentage of cardiac intervals in which a unit fires), and (iii) the number of spikes generated per cardiac interval (incidence of multiple firing). By combining this information with data derived from multi-unit recordings a more detailed assessment of human sympathetic activity can be obtained. Figure 1 provides an illustration of recordings obtained in two different patients who present high multiunit sympathetic activity but different firing pattern. Figure 1. Nerve recordings obtained from two hypertensive patients who both displayed a very high level of multiunit MSNA (98 and 66 bursts per 100 heartbeats in the first and second patient respectively). The activity of single vasoconstrictor neurons in the first patient is relatively low and regular, with the firing rate being 30 spikes per 100 heartbeats and the incidence of multiple spikes per bursts being 3%. The activity of single vasoconstrictor neurons in the second patient is highly irregular with a firing rate of 53 spikes per 100 heartbeats and the incidence of multiple spikes per bursts of 20%. The spikes are identified by arrows. For each neuron, the superimposition of the spikes (right panels) indicates that the spikes originate from one single vasoconstrictor neuron. Macefield et al. (1994) first described that in healthy individuals single muscle vasoconstrictor neurons usually fire only a solitary spike during a sympathetic burst and that the mean firing frequency and firing probability of single units were low (a vasoconstrictor unit only discharges in about 21% of heart beats). This pattern of behavior has since been replicated by others (Murai et al., 2006; Burns et al., 2007; Lambert et al., 2007). Interestingly, it was subsequently shown that healthy individuals who display a high level of multiunit MSNA still present with firing probabilities and incidence of multiple firing identical to that observed in individuals with low multiunit MSNA, indicating that differences in the number of bursts are due mainly to differences in recruitment of sympathetic fibers (Macefield and Wallin, 1999). While single neurons in healthy individuals have low firing probability and tend to contribute only one spike during a sympathetic burst, the activity of unitary sympathetic neurons seems to be essential for the intensity of the burst during a physiological sympathetic response. For example, inspiratory-capacity apnea causes increased multiunit MSNA together with a large rise in the firing rate and a shift toward multiple spikes per burst (Macefield and Wallin, 1999). Murai et al. (2006) also described that during sympathoexcitation induced by physiological stress such as handgrip exercise or the Valsalva maneuver the absolute values of single-unit MSNA increases more than those of multiunit MSNA. It was also noted that the single-unit pattern in response to stress can vary depending on the stress imposed, with the Valsalva maneuver resulting in a shift toward multiple spikes while handgrip resulted in an increase in firing rate and probability but the incidence of multiple spikes was unchanged. These findings suggest that the sympathoexcitatory response is complex yet does display a degree of specificity with engagement of either changes in the number of fibers firing and/or changes in the firing pattern being in some way dependent upon the stressor involved. It would seem that when investigating physiological responses to various sympathetic challenges, single-unit analyses may be more sensitive than multiunit MSNA. It has been well documented that sympathetic tone is increased in congestive heart failure (Leimbach et al., 1986), obstructive sleep apnea syndrome (Leuenberger et al., 1995), essential hypertension (Wallin and Sundlof, 1979), and obesity (Grassi et al., 1995). With the recent development and wider implementation of single-unit recordings in these patient groups there is a greater appreciation of the fact that the mechanisms by which sympathetic tone is elevated can vary depending on the condition. In individuals with congestive heart failure, an increase in the firing frequency of individual neurons occurs while incidence of multiple spikes within a sympathetic bursts is normal (Macefield et al., 1999; Murai et al., 2009). The sympathetic response to exercise in heart failure patients is different to that of healthy individuals with engagement of a large increase in the activity of single vasoconstrictor neurons being most likely responsible for the intense sympathetic response (Murai et al., 2009) although some involvement of the adrenal system cannot be discounted (Kaye et al., 1995). In obstructive sleep apnea syndrome (Elam and Macefield, 2001) and essential hypertension (Greenwood et al., 1999; Lambert et al., 2007), data indicate an increase in both firing frequency and probability and a shift toward multiple firing per sympathetic bursts. Greenwood et al. (1999) documented that the firing frequency of individual vasoconstrictor neurons was higher in mild rather than in more severe established hypertension, a fact not apparent from multiunit recording. This latter observation is perhaps indicative of the importance of the firing activity of the neurons in the progression of hypertension. Observations from our laboratory indicate that the pattern of sympathetic activation differs between normal-weight and obesity-related hypertension (Lambert et al., 2007). Sympathetic activation in normal-weight hypertension is characterized by an increased firing rate of single vasoconstrictor fibers, increased firing probability and higher incidence of multiple spikes. Sympathetic activation in obesity-related hypertension differs, involving recruitment of previously silent fibers, which fire at a normal rate. Despite having a relatively normal firing pattern, the decrease in overall sympathetic tone associated with weight loss involves alteration in the firing pattern of sympathetic nerves, including a decrease in firing rate, probability of firing as well as a decrease in the incidence of multiple firing within a sympathetic burst (Lambert et al., 2011a). These changes in the firing pattern alone may not be sufficient to induce a decrease in multiunit MSNA. Most likely a decrease in the recruitment of active fibers would also contribute to the reduction in sympathetic nervous activation because recruitment of active fibers is the main mechanism by which sympathetic activation occurs in obesity. These observations indicate that the firing pattern of single vasoconstrictor fibers is crucial in the adjustment of chronic sympathoinhibition associated with weight loss. An incentive for studying single-unit sympathetic activity in anxiety disorders was provided by the observation that patients with either depression or panic disorder may be at increased cardiovascular risk (Kawachi et al., 1994; Penninx et al., 2001) yet examination of sympathetic nervous activity failed to reveal any abnormalities using multiunit MSNA (Wilkinson et al., 1998; Barton et al., 2007). Despite multiunit MSNA not revealing any aberration, it is clear that patients with either panic or major depressive disorder have a highly disturbed sympathetic firing pattern, with both conditions presenting an increase in the firing probability and an increase in the incidence of multiple firing per burst (Lambert et al., 2006, 2008). In line with these findings, it was recently demonstrated that a more disturbed sympathetic firing pattern is related to the underlying psychological stress in subjects with the metabolic syndrome (Lambert et al., 2010), with all parameters of single-unit MSNA being closely related to the affective component but not to the somatic component of the patients’ depressive symptoms, thereby suggesting that a more disturbed firing pattern of sympathetic nervous activity relates more to the psychological traits of the individuals rather than their current metabolic condition. The documentation that single fiber sympathetic patterns may be altered in different ways suggests that there may be functional consequences associated with the firing characteristics of single sympathetic units. The main effect of multiple spikes during a single heart beat is a marked increase in instantaneous firing frequencies. Previous investigations have demonstrated that irregular, compared with regular nerve stimulation may augment the response to effector organs, most likely by favoring a greater noradrenaline release. Indeed, responses to nerve stimulation have been shown to be substantially altered, with irregular electrical stimulation producing faster and more pronounced vasoconstrictor responses than continuous stimulation at a regular frequency in cat skeletal muscle (Andersson et al., 1983), in small arteries and veins from rats (Nilsson et al., 1985), and in rabbit hindquarters (Ando et al., 1993). Dibona and Sawin (1999) observed that the pattern of renal sympathetic nerve stimulation in rats significantly influenced the rapidity, magnitude, and selectivity of the renal vascular and tubular responses. A similar observation was made in skin resistance responses in humans (Kunimoto et al., 1992), however no difference was found between regular and irregular stimulation evoked noradrenaline release in the canine gracilis muscle (Kahan et al., 1988). Whether the firing pattern of single vasoconstrictor neurons influences noradrenaline release and organ response cannot be easily proven in the clinical setting but if multiple firing contributes to an increase of multiunit activity, the net effect may be greater increases of vascular resistance than if multiple firing remains unchanged. Of particular relevance is a recent study by our group indicating that the firing pattern of single-unit muscle vasoconstrictor fibers was associated to the rate of spillover of noradrenaline from the heart, with an irregular firing pattern, as indicated by high incidence of multiple spikes within a cardiac cycle, being linked with a more pronounced cardiac noradrenaline spillover to plasma (Lambert et al., 2011b; Figure 2). Interestingly, the pattern of sympathetic firing bore no association to multiunit MSNA or to whole body noradrenaline spillover, suggesting a specific link between an irregular sympathetic nerve firing pattern to cardiac noradrenaline release. Figure 2. 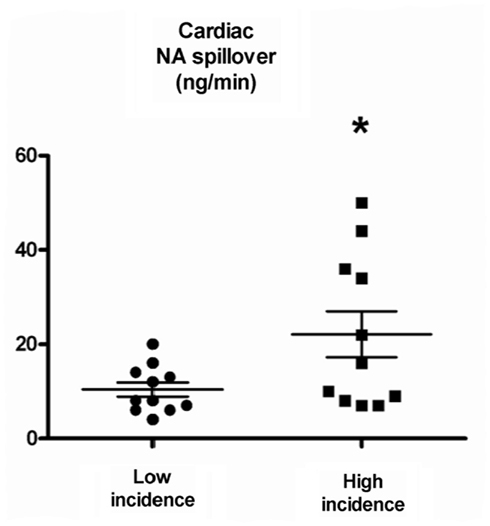 Cardiac noradrenaline (NA) spillover in subjects with low and high incidence of multiple spikes. In all subjects combined, the median value of the incidence of multiple spikes per was 9%. Low incidence of multiple spikes was defined as <9% and high incidence was >9%. From Lambert et al. (2011b). Whether an irregular firing pattern conveys more detrimental consequences than a regular firing pattern is an intriguing possibility. Elam et al. (2002) reported that in patients with congestive heart failure and obstructive sleep apnea, premature heart beats are followed by a large sympathetic burst in response to the greater fall in arterial pressure and reduced baroreceptor inhibition that is essentially produced via increased firing probability and multiple within-burst firing. These large volleys of MSNA may be paralleled by similar surges of cardiac sympathetic discharge, a notion underlined by the recent demonstration that cardiac noradrenaline spillover is doubled in individuals with irregular firing pattern compared to those with a regular firing pattern (Lambert et al., 2011b). Given the observation that ectopic beats are associated with a significantly increased cardiac death rate after myocardial infarction (Moss et al., 1979), an irregular nerve pattern associated with increased noradrenaline release may be one underlying mechanism for the increased risk of sudden death associated with ectopic heart beats. In patients with essential hypertension there is evidence that the incidence of sudden death is more common in those with left ventricular hypertrophy and ventricular arrhythmias (Saadeh and Jones, 2001). Essential hypertension is characterized by elevated cardiac sympathetic activation, (Schlaich et al., 2004) and disturbed sympathetic firing pattern (Lambert et al., 2007), with increased cardiac noradrenaline spillover being associated with disturbances in cardiac structure (Schlaich et al., 2003). Whether an irregular sympathetic firing pattern is involved in the initiation or progression of cardiovascular risk is unknown but this idea is supported by the findings from Burns et al. (2007), who demonstrated a strong positive relationship between the firing frequency of sympathetic vasoconstrictor neurons and left ventricular mass index in overweight hypertensive individuals. The issue as to whether an irregular firing pattern confers greater cardiovascular risk is harder to reconcile in obesity. While obesity is an established risk factor for cardiovascular disease development and progression, this condition is associated with elevated multiunit MSNA, yet the firing pattern of single vasoconstrictor neurons is surprisingly normal (Lambert et al., 2007). Moreover, the pattern of spillover of noradrenaline to plasma indicates a specific pattern whereby the renal and muscle sympathetic outflows are activated whereas the cardiac is spared (Rumantir et al., 1999). It is becoming apparent that a more refined approach of quantifying sympathetic nervous activity holds promises for revealing the underlying mechanisms of sympathetic drive in clinical conditions. With aberrant firing patterns the potential deleterious effects on end organ damage and disease progression are a concern and prompts the question as to whether and how different anti-adrenergic treatments would affect noradrenaline-induced depolarization and subsequent changes in the firing pattern in order to mitigate, in particular, cardiac risk. Delineating the effects of pharmacological and lifestyle interventions on the firing characteristics of sympathetic fibers certainly has important therapeutic implications, particularly in hypertension where the prevention of left ventricular dysfunction and hypertrophy is crucial. Likewise, in congestive heart failure patients, the highly disturbed firing pattern observed at rest and during exercise may contribute to exercise intolerance and disease progression. While technically challenging, it is hoped that future studies will provide direction for the therapeutic targeting of the firing characteristics of single sympathetic fibers. Targeting specifically the firing pattern associated with increased sympathetic drive may hold promise in limiting target organ damage. Andersson, P. O., Bloom, S. R., and Jarhult, J. (1983). Colonic motor and vascular responses to pelvic nerve stimulation and their relation to local peptide release in the cat. J. Physiol. (Lond.) 334, 293–307. Ando, S., Imaizumi, T., and Takeshita, A. (1993). Effects of patterns of sympathetic nerve stimulation on vasoconstricting responses in the hindquarter of rabbits. J. Auton. Nerv. Syst. 45, 225–233. Barton, D. A., Dawood, T., Lambert, E. A., Esler, M. D., Haikerwal, D., Brenchley, C., Socratous, F., Kaye, D. M., Schlaich, M. P., Hickie, I., and Lambert, G. W. (2007). Sympathetic activity in major depressive disorder: identifying those at increased cardiac risk? J. Hypertens. 25, 2117–2124. Burns, J., Sivananthan, M. U., Ball, S. G., Mackintosh, A. F., Mary, D. A., and Greenwood, J. P. (2007). Relationship between central sympathetic drive and magnetic resonance imaging-determined left ventricular mass in essential hypertension. Circulation 115, 1999–2005. Dibona, G. F., and Sawin, L. L. (1999). Functional significance of the pattern of renal sympathetic nerve activation. Am. J. Physiol. 277, R346–R353. Elam, M., and Macefield, V. (2001). Multiple firing of single muscle vasoconstrictor neurons during cardiac dysrhythmias in human heart failure. J. Appl. Physiol. 91, 717–724. Elam, M., Mckenzie, D., and Macefield, V. (2002). Mechanisms of sympathoexcitation: single-unit analysis of muscle vasoconstrictor neurons in awake OSAS subjects. J. Appl. Physiol. 93, 297–303. Grassi, G., Seravalle, G., Cattaneo, B. M., Bolla, G. B., Lanfranchi, A., Colombo, M., Giannattasio, C., Brunani, A., Cavagnini, F., and Mancia, G. (1995). Sympathetic activation in obese normotensive subjects. Hypertension 25, 560–563. Greenwood, J. P., Stoker, J. B., and Mary, D. A. (1999). Single-unit sympathetic discharge: quantitative assessment in human hypertensive disease. Circulation 100, 1305–1310. Kahan, T., Pernow, J., Schwieler, J., Wallin, B. G., Lundberg, J. M., and Hjemdahl, P. (1988). Noradrenaline release evoked by a physiological irregular sympathetic discharge pattern is modulated by prejunctional alpha- and beta-adrenoceptors in vivo. Br. J. Pharmacol. 95, 1101–1108. Kawachi, I., Colditz, G. A., Ascherio, A., Rimm, E. B., Giovannucci, E., Stampfer, M. J., and Willett, W. C. (1994). Prospective study of phobic anxiety and risk of coronary heart disease in men. Circulation 89, 1992–1997. Kaye, D. M., Lefkovits, J., Cox, H., Lambert, G., Jennings, G., Turner, A., and Esler, M. D. (1995). Regional epinephrine kinetics in human heart failure: evidence for extra-adrenal, nonneural release. Am. J. Physiol. 269, H182–H188. Kunimoto, M., Kirno, K., Elam, M., Karlsson, T., and Wallin, B. G. (1992). Neuro-effector characteristics of sweat glands in the human hand activated by irregular stimuli. Acta Physiol. Scand. 146, 261–269. Lambert, E., Dawood, T., Schlaich, M., Straznicky, N., Esler, M., and Lambert, G. (2008). Single-unit sympathetic discharge pattern in pathological conditions associated with elevated cardiovascular risk. Clin. Exp. Pharmacol. Physiol. 35, 503–507. Lambert, E., Dawood, T., Straznicky, N., Sari, C., Schlaich, M., Esler, M., and Lambert, G. (2010). Association between the sympathetic firing pattern and anxiety level in patients with the metabolic syndrome and elevated blood pressure. J. Hypertens. 28, 543–550. Lambert, E., Hotchkin, E., Alvarenga, M., Pier, C., Richards, J., Barton, D., Dawood, T., Esler, M., and Lambert, G. (2006). Single-unit analysis of sympathetic nervous discharges in patients with panic disorder. J. Physiol. (Lond.) 570, 637–643. Lambert, E., Straznicky, N., Schlaich, M., Esler, M., Dawood, T., Hotchkin, E., and Lambert, G. (2007). Differing pattern of sympathoexcitation in normal-weight and obesity-related hypertension. Hypertension 50, 862–868. Lambert, E. A., Schlaich, M. P., Dawood, T., Sari, C., Chopra, R., Barton, D. A., Kaye, D. M., Elam, M., Esler, M. D., and Lambert, G. W. (2011b). Single-unit muscle sympathetic nervous activity and its relation to cardiac noradrenaline spillover. J. Physiol. (Lond.) 589, 2597–2605. Leimbach, W. N. Jr., Wallin, B. G., Victor, R. G., Aylward, P. E., Sundlof, G., and Mark, A. L. (1986). Direct evidence from intraneural recordings for increased central sympathetic outflow in patients with heart failure. Circulation 73, 913–919. Leuenberger, U., Jacob, E., Sweer, L., Waravdekar, N., Zwillich, C., and Sinoway, L. (1995). Surges of muscle sympathetic nerve activity during obstructive apnea are linked to hypoxemia. J. Appl. Physiol. 79, 581–588. Macefield, V. G., Rundqvist, B., Sverrisdottir, Y. B., Wallin, B. G., and Elam, M. (1999). Firing properties of single muscle vasoconstrictor neurons in the sympathoexcitation associated with congestive heart failure. Circulation 100, 1708–1713. Macefield, V. G., and Wallin, B. G. (1999). Firing properties of single vasoconstrictor neurones in human subjects with high levels of muscle sympathetic activity. J. Physiol. (Lond.) 516(Pt 1), 293–301. Macefield, V. G., Wallin, B. G., and Vallbo, A. B. (1994). The discharge behaviour of single vasoconstrictor motoneurones in human muscle nerves. J. Physiol. (Lond.) 481(Pt 3), 799–809. Moss, A. J., Davis, H. T., Decamilla, J., and Bayer, L. W. (1979). Ventricular ectopic beats and their relation to sudden and nonsudden cardiac death after myocardial infarction. Circulation 60, 998–1003. Murai, H., Takamura, M., Maruyama, M., Nakano, M., Ikeda, T., Kobayashi, D., Otowa, K., Ootsuji, H., Okajima, M., Furusho, H., Takata, S., and Kaneko, S. (2009). Altered firing pattern of single-unit muscle sympathetic nerve activity during handgrip exercise in chronic heart failure. J. Physiol. (Lond.) 587, 2613–2622. Murai, H., Takata, S., Maruyama, M., Nakano, M., Kobayashi, D., Otowa, K., Takamura, M., Yuasa, T., Sakagami, S., and Kaneko, S. (2006). The activity of a single muscle sympathetic vasoconstrictor nerve unit is affected by physiological stress in humans. Am. J. Physiol. Heart Circ. Physiol. 290, H853–H860. Nilsson, H., Ljung, B., Sjoblom, N., and Wallin, B. G. (1985). The influence of the sympathetic impulse pattern on contractile responses of rat mesenteric arteries and veins. Acta Physiol. Scand. 123, 303–309. Penninx, B. W., Beekman, A. T., Honig, A., Deeg, D. J., Schoevers, R. A., Van Eijk, J. T., and Van Tilburg, W. (2001). Depression and cardiac mortality: results from a community-based longitudinal study. Arch. Gen. Psychiatry 58, 221–227. Rumantir, M. S., Vaz, M., Jennings, G. L., Collier, G., Kaye, D. M., Seals, D. R., Wiesner, G. H., Brunner-La Rocca, H. P., and Esler, M. D. (1999). Neural mechanisms in human obesity-related hypertension. J. Hypertens. 17, 1125–1133. Saadeh, A. M., and Jones, J. V. (2001). Predictors of sudden cardiac death in never previously treated patients with essential hypertension: long-term follow-up. J. Hum. Hypertens. 15, 677–680. Schlaich, M. P., Kaye, D. M., Lambert, E., Sommerville, M., Socratous, F., and Esler, M. D. (2003). Relation between cardiac sympathetic activity and hypertensive left ventricular hypertrophy. Circulation 108, 560–565. Schlaich, M. P., Lambert, E., Kaye, D. M., Krozowski, Z., Campbell, D. J., Lambert, G., Hastings, J., Aggarwal, A., and Esler, M. D. (2004). Sympathetic augmentation in hypertension: role of nerve firing, norepinephrine reuptake, and angiotensin neuromodulation. Hypertension 43, 169–175. Wallin, B. G., and Sundlof, G. (1979). A quantitative study of muscle nerve sympathetic activity in resting normotensive and hypertensive subjects. Hypertension 1, 67–77. Wilkinson, D. J., Thompson, J. M., Lambert, G. W., Jennings, G. L., Schwarz, R. G., Jefferys, D., Turner, A. G., and Esler, M. D. (1998). Sympathetic activity in patients with panic disorder at rest, under laboratory mental stress, and during panic attacks. Arch. Gen. Psychiatry 55, 511–520. Accepted: 17 January 2012; Published online: 07 February 2012. Copyright: © 2012 Lambert, Hering, Schlaich and Lambert. This is an open-access article distributed under the terms of the Creative Commons Attribution Non Commercial License, which permits non-commercial use, distribution, and reproduction in other forums, provided the original authors and source are credited.